Having partnered for the winter holiday season last year, Whole Foods Market and PBS Kids are teaming up again for the back-to-school season this year. The two brands are backing a variety of eco-friendly school supplies, from notebooks made from recycled paper to organic cotton backpacks and reusable lunch totes. Many of the proceeds from the sales will be used to support PBS Kids’ educational programming and the Whole Kids Foundation, which is dedicated to improving children’s nutrition and wellness. For the partnership, Whole Foods will feature Esperos of organic cotton canvas products, and will debut a new line of reusable food keepers called Lunchskins. The grocer will also carry notebooks and folders from Mudpuppy. 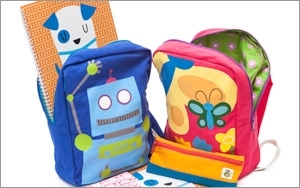 (The products will carry a small PBS Kids logo and on their tags.) PBS Kids and Whole Foods previously partnered on a line of eco-friendly toys for the 2014 holiday season. “By working with suppliers like Esperos, Lunchskins and Mudpuppy, kids can get school supplies that truly do more—proceeds from every product support children’s education through PBS KIDS and healthy-eating education through Whole Kids Foundation—plus, each product is either reusable or made with recycled or organic materials,” Jeanne Tamayo, global lifestyle buyer at Whole Foods Market, said in a statement. The companies will market the products through their digital and social properties, as well as through in-store packaging calling out the “give-back element” of the partnership, Ciccone says. In addition, Whole Foods will feature exclusive content from the PBS Kids series “Daniel Tiger’s Neighborhood” on its website.